I always imagine songs on a graph with the difficulty on the vertical axis and the coolness of sound on the horizontal axis. Ok so what we are looking for is cool sounding but easy to play, we strive for cool sounding but difficult to play and we sometimes have to accept not-that-cool-sounding if they are easy to play. What we have to avoid is difficult and not good sounding songs in our repertoire. Anyway this song by Pink Floyd is a great song with a nice guitar part – learn this and play it (casually like) in front of your mum and dad (ok ok maybe your granma and grandad would be more like it.) and I can almost guarantee it will send them off reminiscing and rummaging through a big old pile of albums looking for the original track. This is a nice approach to picking the guitar using the fingers of your right hand to sound the strings (instaed of a pick, or your teeth) The general rule (more of a general practise than a rule), is to use your thumb to pick the 6, 5 & 4 strings then each of the treble strings has a finger each. Pick the 3rd string with your 1st finger (the finger nearest to your thumb) the 2nd string gets plucked by your 2nd finger and the 1st string (the string nearest to the floor) gets worked over by your 3rd finger. In classical guitar parlance your thumb is ‘p’, your 1st finger (index finger) is ‘i’ your 2nd finger (middle finger) is ‘m’ and your 3rd finger (ring finger) is ‘a’. I love this band. They are never afraid to do the obvious or recycle cliches but they make it sound so good !! If you are writing songs never be afraid of G Em C D, just because it has been done a million times before. The reason it has been done a million times before is simple – it sounds so complete and it never fails to satisfy. I use this song a lot for NCEA here in New Zealand. To me it is the ideal Level 1 song – it has picking, strumming, power chords and a guitar lead part. This is nice, and easy to play. The magic of this song is that E/G# chord. Slash chords like this( E ‘slash’ G# ) are often what is called a chord inversion. In the normal state of things the lowest note you hear when someone plays a chord is the root note of the chord. So for an E chord that is normally the 6th string, the low E. A chord inversion is where one of the other notes out of the chord gets used as a bass note and in this case the note used is the major 3rd of E which is G#. Slash chords dont have to be chord inversions – the main thing for us to remember is that the note after the / sign is an instruction for the bass player. So for E/G# we play the regular E chord and the bass player takes the G#. And the D is really Dsus2 which is just your regular D but with the first string open. I posted a video on how to play this just below the song sheet. Ya gotta click in the video twice to watch it – once to activate and once to play. If your connection is slow pause the playback while it downloads. Pink! Catchy song, great chorus. It is actually played in the key of A and the chords used on the CD are A, Bm, F#m, E, D. Mmmmm 2 bar chords… I put it in G and then played it with a capo at the 2nd fret so there are no barchords and that little lick that starts and ends the song and is all through it uses open strings and one fretted note. If you play it in A ( without a capo ) then the guitar lick is at the 2nd fret barring the 2nd and 3rd strings with your first finger and stretching up to the 5th fret of the 2nd string with your pinky. Play the lick with all down strokes but once you break into chords ‘down down up up down’ will do ya. 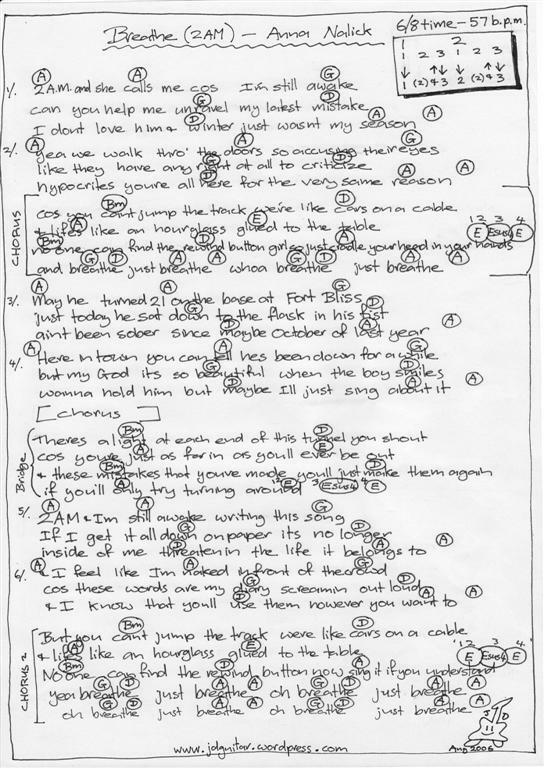 The best thing to do with these song sheets is save’m to your desktop ‘n then open’m probably with windows photo and fax viewer if you double-click them. I saw James Blunt playing this song on telly here in NZ and he capoed his guitar up on the 8th fret and instead of playing in the key of C he started with a G. This version capoed at the 3rd fret sounds fine and doesn’t require a lot of fiddling with the tuning which you seem to need further up the neck. If I have a choice I always prefer to use the capo on even numbered frets because that keeps the fret marker dots on the dotted frets same as no capo Capo on the 3rd fret puts you’re in the same key as the song and means you can play along with the CD which is one of the best ways to practice. Notice how the 3rd fret of the first string (the note G) rings through all of the chord changes. Get your little finger on that note and leave it there through all of the verse. In the chorus we have been changing back to standard shapes. It is a tough song to sing that guy can get so high. When I draw a chord symbol in a circle it is supposed to mean strum for one bar. When the circles are connected by a line it is our way of showing that the chords are in the same bar and means they get two beats each. 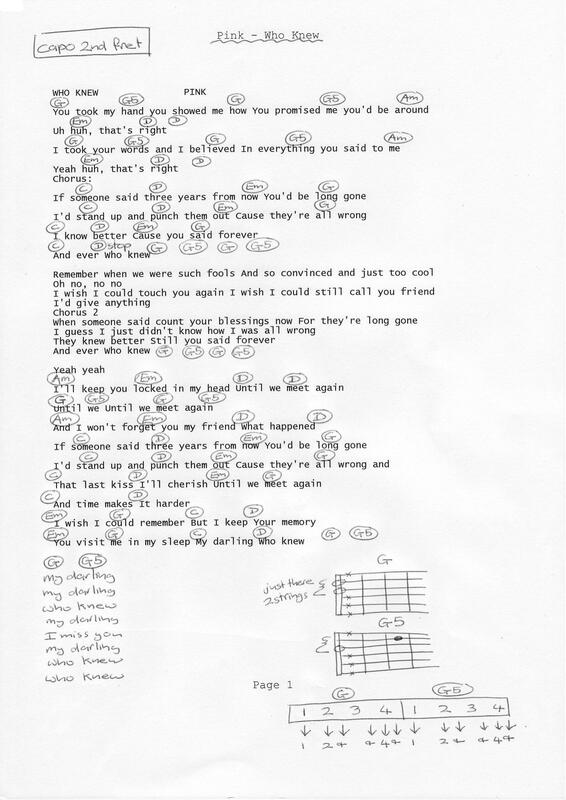 That is the lead part at the top of the music sheet – listen to the song for the timing. Some ‘a these thumbnails don’ open so good in Internet Explorer. If you single click the thumbnail you could select ‘save’ and save it to your desktop and then you could open it from there with windows pictures and fax viewer – that seems to work better with these gif images. Hi there - welcome to my site. If you are not familiar with blogs then note this: posts and pages are different things. Posts are chronological with the most recent at the top (in the main column) Pages exist separately and can only be reached through the links below this text in this column. Below the list of pages I have links to most of the posts on this site to save you having to scroll for ages. (Typical teacher you see, I have to make a lesson out of everything) Cheers, thanks for calling in, Geoff. A guitar tuner, new songs and how to play ‘Happy Birthday’.